Tuscany Wine and Bike (TWB) announced their new 2014 Wine Tasting & Culinary Biking Tour Itineraries effective April 26, 2014 through September 27, 2014. Led by local freelance oenologist and Winemaker Carlo Travagli and cycling enthusiast Luca Casini, TWB tours trek on mountain bikes across the provinces of Siena, Firenze, Pisa and Pistoia through the scenic, historic Chianti Wine Region of Tuscany. On the TWB TOUR, participants will awaken their senses through the vibrant colors, intoxicating scents, and breathtaking sights as Tuscany’s most robust seasons dramatically unfold before them. Cycling through fragrant olive groves, rolling vineyards, vibrant sunflowers fields, majestic woods, and other fascinating scenic spots, participants will uncover the most authentic aspects of Tuscany, often missed and overlooked by visitors using conventional means of transportation. Experience Tuscan life, people, culture and places traveling through towns and farmlands, with opportunities to stay overnight. Learn about one of the world’s most famous winemaking regions, the microclimates, viticultural areas and revered varietals, and the role of its landscape and history. Savor the distinct flavors of the countryside including the local harvests, cherished honey, succulent olives & oils, sumptuous salumi, handcrafted cheeses, and enjoy the regional artisan products and cuisine of TWB select regional partners. Taste regional wines among the vineyards and cellars while visiting local estates, receiving both lessons and guided tastings by Travagli, an award-winning winemaker of Chianti, Chianti Classico (Gallo Nero Black Rooster), Sangiovese, and IGT Super Tuscan wines. No rigorous physical conditioning is required for the majority of the TWB itineraries. However, for both intermediate and advanced cyclists, Travalgi and Casini have designed several challenging itineraries including the 7-day Bio Week Tour. The Bio Week Tours have additional activities such as cooking lessons, donkey treks, and urban bike tours. Customized Tours are also available. 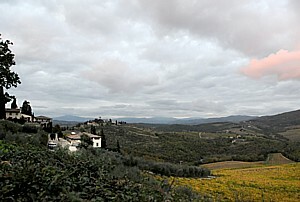 For more information, visit the Tuscany Wine and Bike website, Email TWB or call (+39)333 9206700.